Soñadora's teak decks have had a hard life. Until the late 90s, she was in the wet Pacific Northwest. 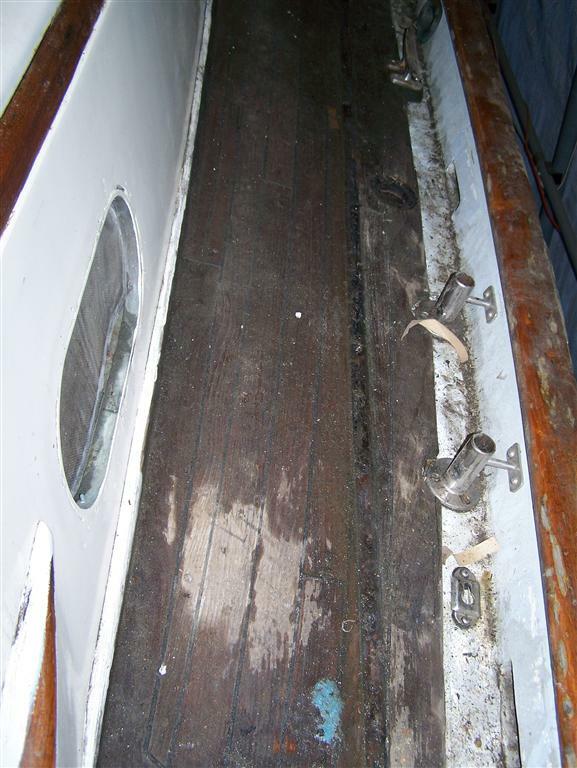 Then we brought her to MN, where any moisture in the deck over winter would freeze and expand, causing splits in the deck. We kept her covered over winter, but that doesn't prevent the boat from freezing. Still, we didn't notice any major damage to the decks due to this. Over time, teak will wear down and dry out to some degree. Also, the caulk between the boards will crack with age and simply come out of the groove between the planks. The teak plugs put in over screws will also wear down exposing the screw heads. Planks will 'cup' and expose the grain when they age. This is exacerbated if harsh chemicals or firm brushes are used to clean the deck. Our deck was exhibiting all of these characteristics of aging. 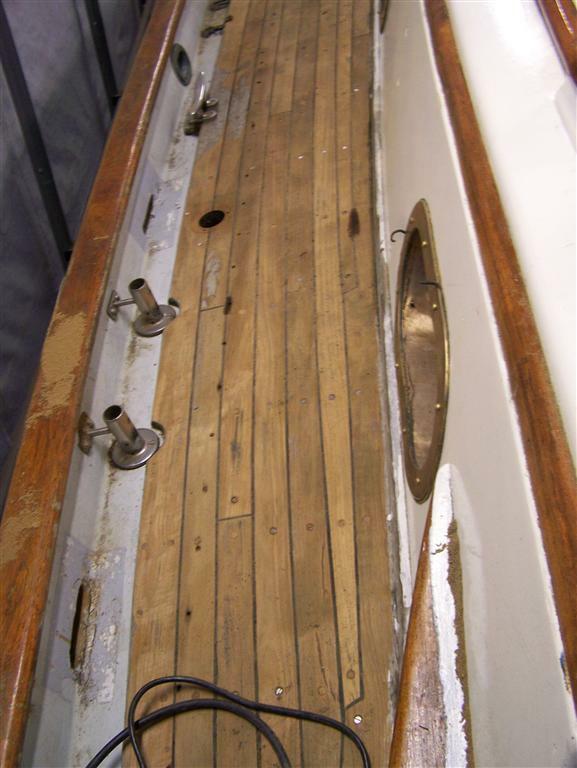 One major job during the refit is to recaulk the deck. This requires all deck hardware be removed (as much as you can anyway). I had to remove the jib track and deck fills. I polished a couple of those fills and they sure do look nice! Then, the deck needs to be sanded. First I tried using a RO (random orbital) sander, but that was hardly making a dent. I then switched to a belt sander with 50 grit paper and that was the way to go. My decks are pretty thick, so I wasn't too concerned about removing too much wood. Hopefully this will be the last time anything like this will need to be done! Then, with everything sanded, the Fein Multimaster will go to work with the caulk blade and 'scoop' out the old caulk. I've played around with this tool a little already and it is really going to make the difference between getting this job done by end of Feb or end of May. I hope to have this job done by end of February. This page contains a single entry by Rick published on January 29, 2012 10:10 PM. Music to the Ears was the previous entry in this blog. More Deck is the next entry in this blog.